Lemonadeberry flavor is hard to describe. Certainly it’s very tart/sour, with a hint of lemons (citric acid). 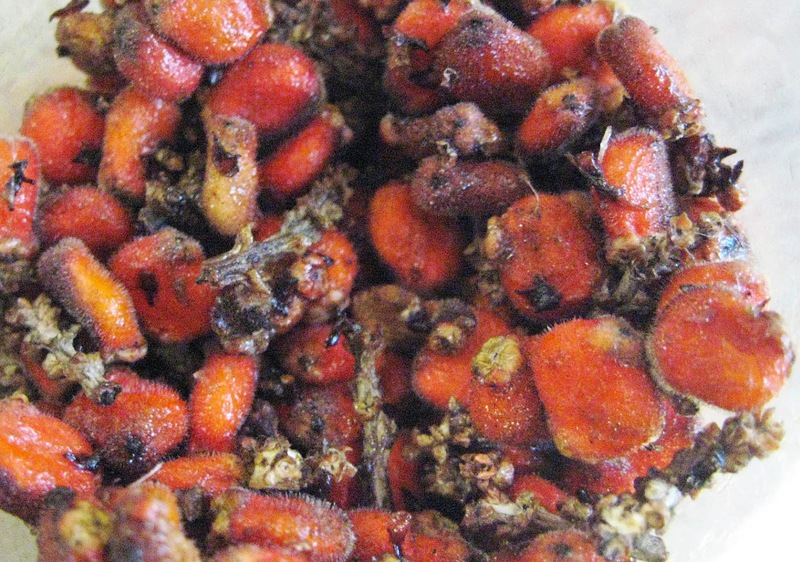 But the flavor is distinctive, perhaps because of the unique blend of citric acid, other acids (likely malic and ascorbic acids) and other plant compounds. You just have to taste it to know it. First a note on picking. Fruits are ripe when they are dark orange-red to dark red and dripping. Put one in your mouth – ripe fruits have a strong sweet-tart taste. The fruits are very sticky. We suggest wearing old clothes and a pair of thin latex gloves; even so, you’re bound to get a little sticky. The ripe fruits should come off easily when you pull them; collect into a plastic bag (best because you can close it up) or non-metal bowl or container. Some people cut off entire fruiting clusters, removing the fruits in the comfort of their kitchen. But these fruits are so easy to pick that we just pull them off in the garden. If you plan to use your fruit to make jelly, syrup or any other recipe that requires heat, you may want to choose fruits that are more orange-red than red. These fruits, which are slightly less ripe, are more tart and flavorful in cooked recipes. 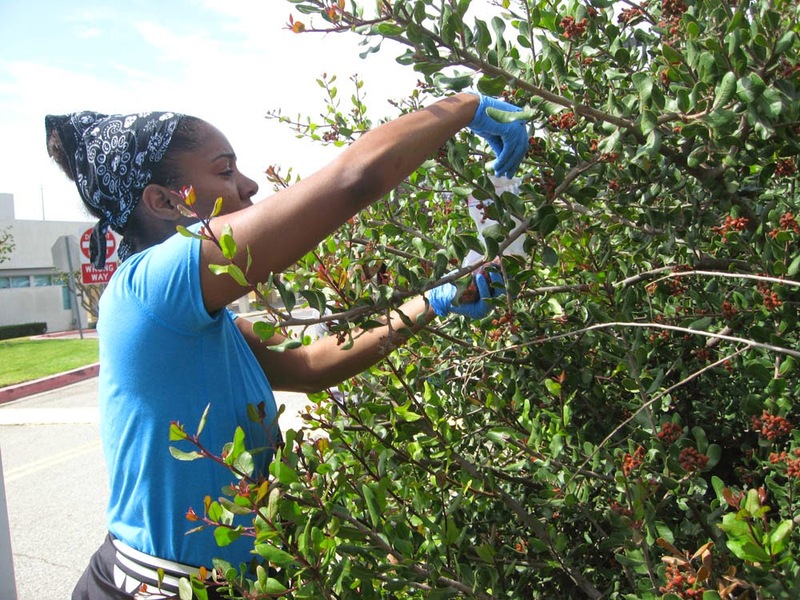 Try to pick fruits that are relatively clean. Harvest away from major roadways and choose fruits that are free of dust if possible. As always, collecting fruit from your own bushes is safest; you know they haven’t been sprayed with something noxious. 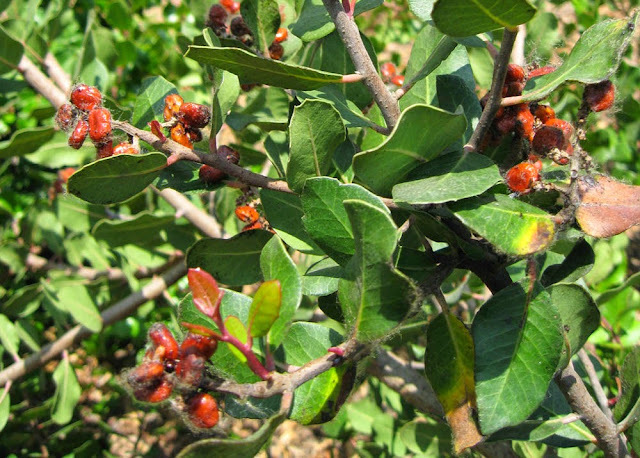 Unlike most fruits, the flavored part of the Lemonadeberry fruit is the sticky coating. Do not wash the fruits or you’ll wash away the flavoring. Pick out any leaves or twigs – that’s all the processing that’s required. Many Lemonadeberry recipes begin with Lemonadeberry ‘juice’ (really water flavored with the fruit secretions). This is simplicity itself to prepare. Place unwashed fruits into a non-reactive container (glass or pyrex is best). Be sure to leave a little extra room, as fruits will swell slightly. Just cover the fruits with cool water and let the mixture sit for 2-4 hours (or overnight in the refrigerator). Stir or swirl the mixture occasionally so the sticky secretions dissolve. At the end of soaking, fruits should appear slightly swollen and pale. Remove as many fruits as possible with a slotted spoon (use the fruits in the compost). Pour the liquid through a sieve to remove the remaining fruits and other particles. 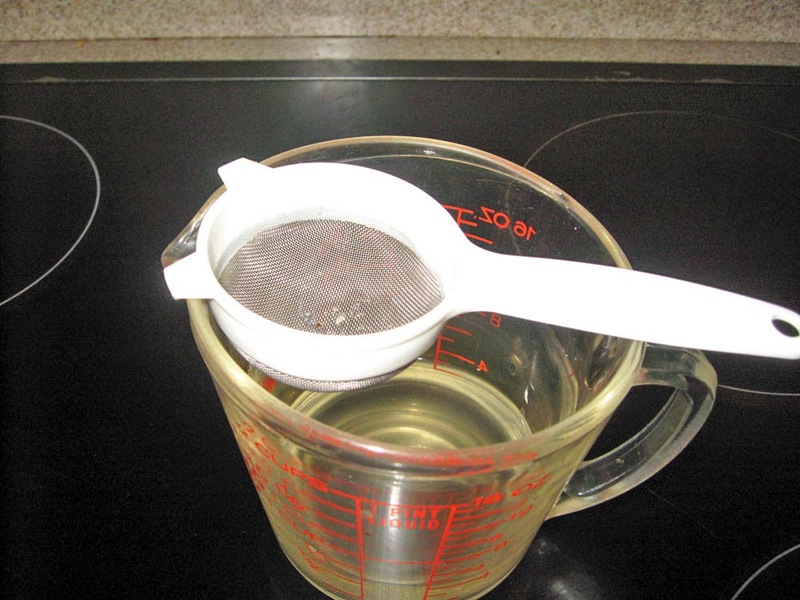 We like to use a medium-mesh sieve to remove the larger stuff, then a fine meshed sieve for a final straining. If there are lots of small particles, consider lining the fine sieve with several layers of cheesecloth before straining. 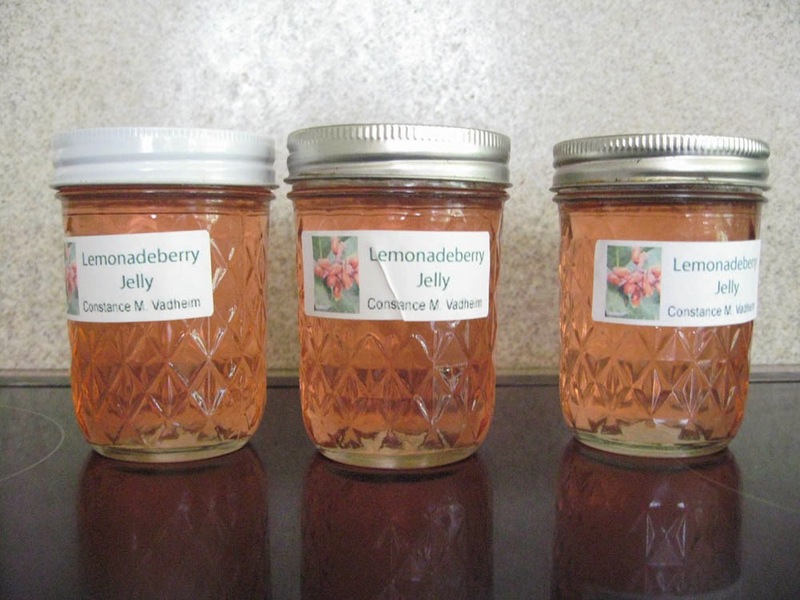 You now have Lemonadeberry juice, which can be used in several ways (see recipes, below). The juice can also be stored in the refrigerator for up to three days or frozen for later use. 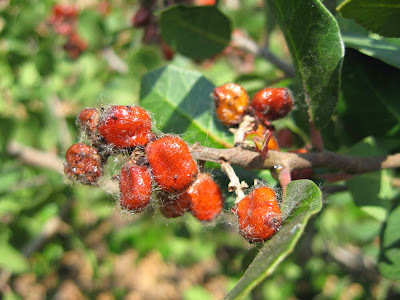 The fruits of other Rhus species are dried and used as a seasoning in Mediterranean and Middle Eastern recipes. You can easily dry Lemonadeberry fruits for use on salads or in yoghurt, marinades, dips, hummus or other traditional recipes featuring sumac. 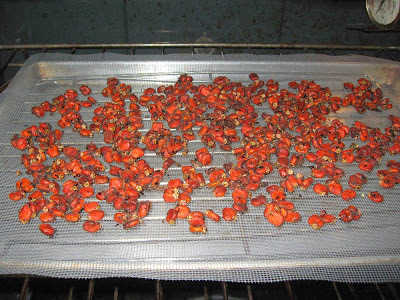 You can air-dry Lemonadeberry fruits if the weather is hot and dry; or speed the process in a food dryer or warm oven. Either way, the process will take several days to complete, so be patient. We like to spread the fruits on a clean piece of screen on a baking rack to insure good air circulation (see photo above). If air-drying, cover with another piece if screen. 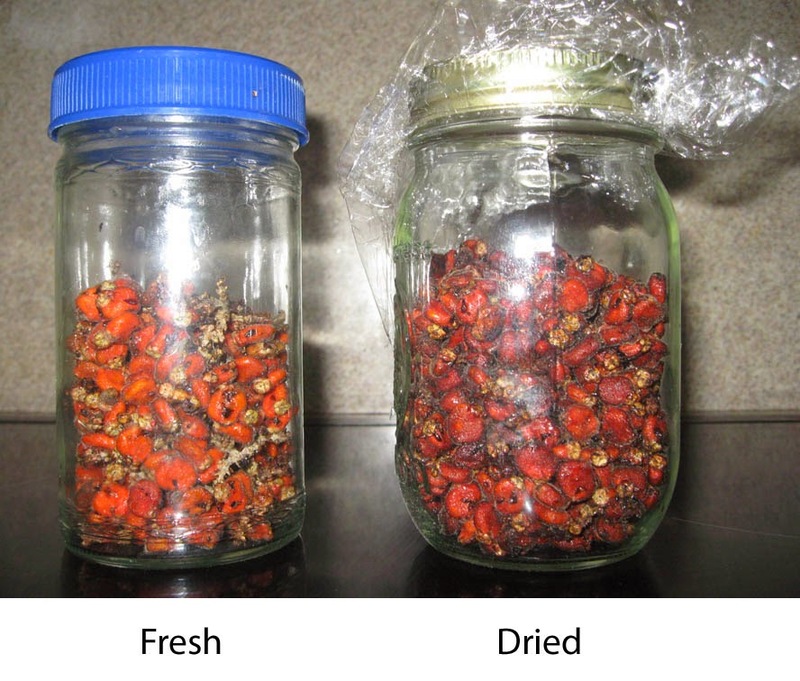 We dry our fruits in a warm oven over 3-4 days. We heat the oven to ‘warm’ (less than 150°F or 65°C) several times a day, letting the fruits dry slowly. Fruits are dry when they look slightly darker and are slightly decreased in size. The differences between dry and fresh berries are subtle; cut one in half to check for dryness. Store dry fruits whole in a glass jar with a tight lid; or grind them in a spice mill, then store the dried seasoning in an airtight glass jar. Pour cool Lemonadeberry juice in a glass. Add sugar or honey to taste. Stir and enjoy! Place sugar, food coloring (optional) and juice in a heavy saucepan. Simmer over medium heat until mixture almost boils. Turn down heat and simmer 5 additional minutes. Remove from heat. Let cool. Store in a closed jar or bottle in the refrigerator for up to 1 month. Or process with a boiling water bath (as for jelly) to store for several years at room temperature. You can make this syrup in any amount needed – just use 1 cup sugar (or other as desired) per cup of juice. This syrup makes a refreshing sweet-tart summer drink when used to flavor sparkling water. You can also use it in punch, over ice cream, sliced fruits or cake, etc. This is an adult flavor – young children may find it too ‘sour’. Place the juice and pectin in a large, heavy pot (6 quart/liter or larger). Bring to full rolling boil, stirring often. Add the sugar all at once and stir in quickly; if using food coloring, add it now. Bring again to full rolling boil. Boil 1 minute. 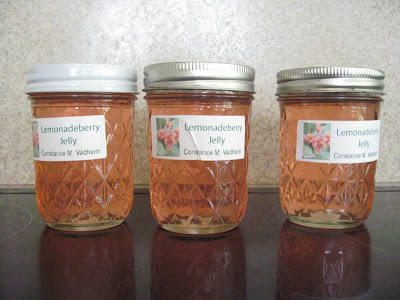 Fill prepared canning jars. Process in boiling water bath for 5 minutes if canning at less than 1000 feet elevation (*Add 1 additional minute for each additional 1000 feet of altitude). 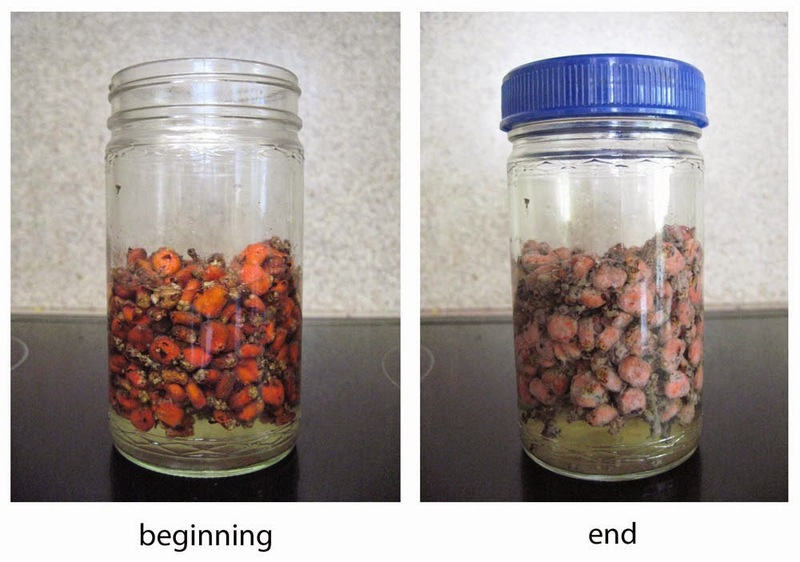 Remove jars from water bath. Let cool; check to be sure that lids have sealed. Makes about five to six 8-oz jars. A sweet-tart favorite that’s great on toast and English muffins! Heat juice to 150° F. (warm). Place juice in a non-metal bowl. Gradually whisk in the gelatin, making sure that it completely dissolves (no lumps). Pour mixture into a lightly oiled 8x8 inch pan (or prepared candy molds). Refrigerate for 1-2 hours (or until set). Cut/un-mold and serve. In Mother Nature’s Backyard, we’ve already seen a first wave of the smaller butterflies known collectively as ‘Skippers’ (family Hesperiidae). The Skippers are somewhat different in appearance and separated from other common butterflies in terms of their evolution. While many local Skippers are yellow-orange and black (or white and black), one group is notable for its dark color and medium size. These are the Duskywing butterflies, grouped in the genus Erynnis. If you’ve seen a very dark 1 ½ inch (4 cm) butterfly flitting through your garden it’s likely a Duskywing. The Duskywings are classified as spread-wing Skippers, a group that’s typically dark brown in color. Its members hold both sets of wings open when perching, while other Skippers perch with wings closed. The genus Erynnis contains a number of species, 17 of which are native to N. America. Duskywing species are quite similar in appearance, making them very difficult to tell apart, even from a good photograph. The most accurate way to determine the species is by examining differences in their sexual organs under the microscope. 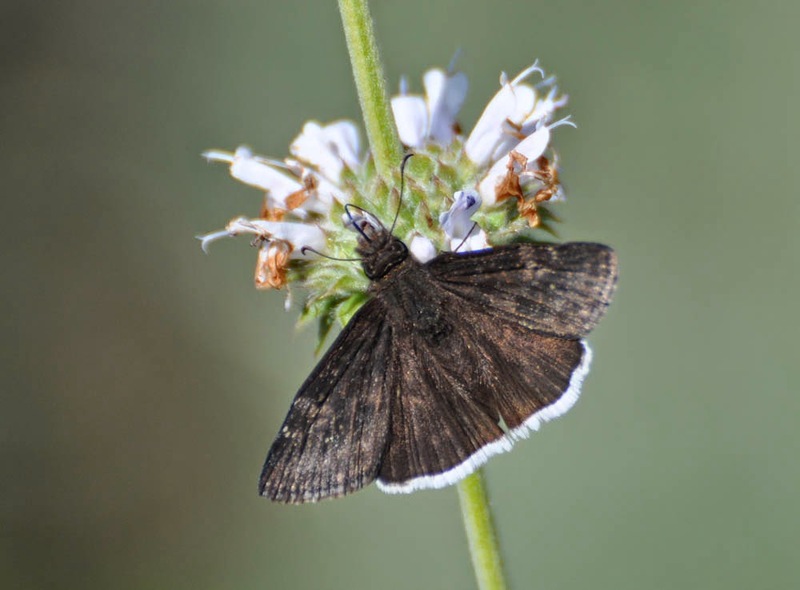 Six Duskywing species are known to inhabit Los Angeles County (see below); most are found only in the wilds, where their larval food plants are common. Of the six, the Funereal Duskywing (Erynnis funeralis) is by far the most likely to visit local gardens; another possible candidate is the Mournful Duskywing (Erynnis tristis) and possibly the Afranius Duskywing (Erynnis afranius). Native Quercus including: Quercus dumosa ; other Quercus spp. 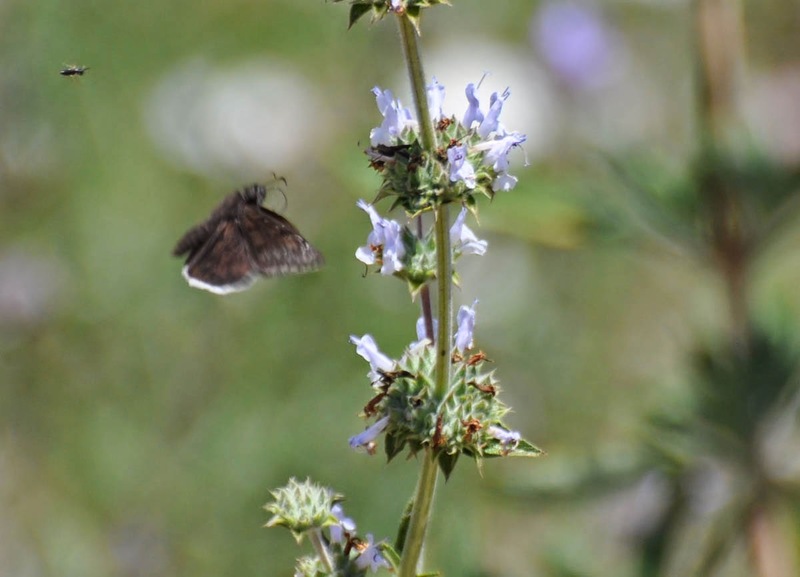 Flower nectar: California buckwheat; Black sage; Stachys spp. The species range for local Duskywings is largely limited by their larval food plants. Three of the six require native oaks (Quercus species) for breeding, including the Mournful Duskywing. If you live in an area with oaks, Mournfuls may visit your garden. The Pacuvious Duskywing requires Ceanothus species – in greater abundance than found in most gardens. The Afranius and Funereal Duskywings utilize a number of native and non-native legume species, making them the best candidates as garden visitors. Funereal Duskywings are difficult to photograph. They are rapid, erratic flyers, moving from flower to flower surprisingly quickly. We’ve had our best luck capturing them nectaring on Black Sage (Salvia mellifera). Be patient and use a telephoto lens; they sometimes rest with wings outstretched (cool days) or closed (in hot sun). 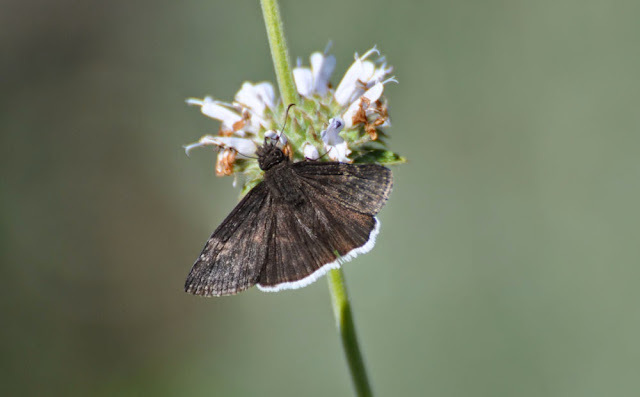 The Funereal Duskywing is a small-medium butterfly 1 ½ to 1 ¾ inches (3.4 - 4.5 cm) wide. It ranges from Southern California, Arizona, New Mexico and Texas south to Argentina and Chile, although it sometimes strays further north. Several characteristics differentiate it from other local Duskywings: 1) its forewing is narrow and pointed, while its hindwing is triangular; 2) the hindwings have a distinctive white fringe, visible on both the upper and lower sides of the wing (clearly visible whether the wings are open or closed – even in flight). Only one other local Duskywing – the Mournful – has white wing fringes. While the overall color of Erynnis funeralis is dark brown, the coloration is more complex and varied than you might expect. As seen above, the front side of the forewing is marked with subtle blotches of gray and lighter brown. The patterns on the forewing extend almost to the edge of the wing and there is a larger, pale splotch (in ours a ring) near the top. The hindwing has a overall coppery cast, in addition to the distinctive white fringe. 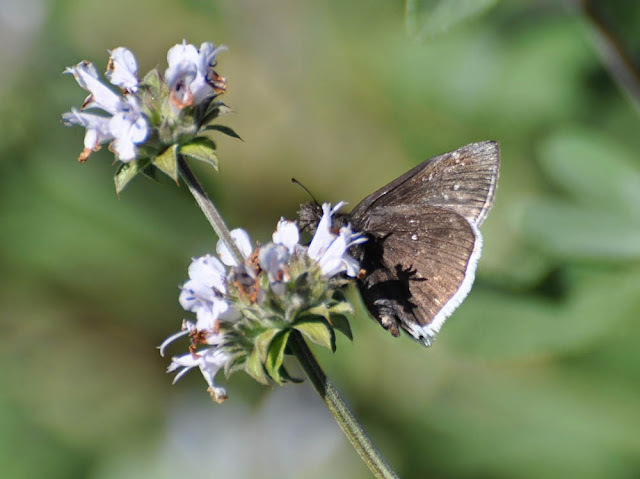 While the adults utilize a range of flowers, they seem particularly fond of Black sage (Salvia mellifera) in our gardens; we’ve also seen them nectaring on the Woodmints (Stachys species) and other plants in the Mint family. Adults are known to ‘puddle’ (sip moisture and minerals from mud or moist sand), although we’ve not observed this (our garden is likely too dry). Funereal Duskywings have three broods a year, during warm weather from March to December. In our area they typically fly from February or early March to early May (first generation), mid-May to late June or July (second generation) and late summer to October or November (third generation). We often see an uptick in numbers in March and again in June/July. The single, yellow eggs are deposited on the leaves of the host plant. Host plants are a range of legumes (family Fabaceae) including Deervetch (Acmispon glaber/Lotus scoparius), Medicago species (alfalfa; Bur-clovers), Olneya tesota (Desert ironwood) and vetch (Vicia species) Larvae are pale, translucent green with faint lines and a dark gray head. Caterpillars eat the leaves and form simple shelters of rolled leaves. It takes about 35 days to progress from egg to adult. If you live near oak trees, you may also see the Mournful Duskywing (Erynnis tristis). This is our second ‘white fringed’ species; it can be distinguished from Erynnis funeralis by a row of long white spots near the margin of the underside of the hindwing. This species flies at the same time as the Funereal Duskywing, with three broods a year. It nectars on a wide range of native and non-native plants including Verbenas, Yerba Santa (Eriodictyon species), California Buckeye (Aesculus californica), native buckwheats (Eriogonum species), Milkweeds and other garden flowers, especially the Butterfly Bush (Buddleia davidii). Larval foods include Coast liveoak (Quercus agrifolia) and other native and non-native oaks. The Afranius Duskywing (Erynnis afranius) is slightly smaller than Erynnis funeralis and has pale-tipped wing fringes, rather than white. Like the Funeral Duskywing, its larvae require legumes, including Deervetch (Acmispon glaber/Lotus scoparius), Lupines (Lupinus species), Spanish Clover (Lotus purshianus), the Goldbanners (Thermopsis species) and Milkvetch (Astragalus species). We have not found records of this species in gardens, however its range, habitat and food requirements suggest it may do so. Four years into a continuing drought in Southern California. We’ve supplemented the meager spring rainfall, hoping our plants make it through the summer. But even in early May, many of the greenest plants are those growing in shade. Among the prettiest shade plants in Mother Nature’s Garden of Health is the Western columbine, Aquilegia formosa. Western columbine is a member of the Ranunculaceae (Buttercup or Crowfoot family), which has a worldwide distribution of around 1800 species. Among the better-known members are Ranunculus (genus Ranunculus), Anemone (genus Anemone), Larkspur (genus Delphinium), Meadow rue (genus Thalictrum) and Clematis (genus Clematis). 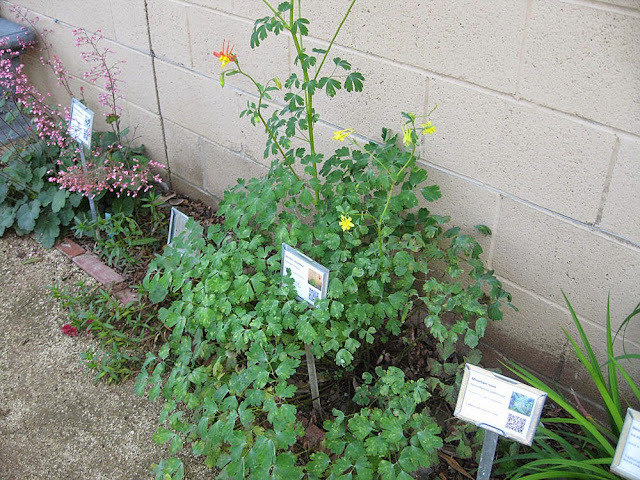 Many species are planted in gardens and some are used in traditional medicine. 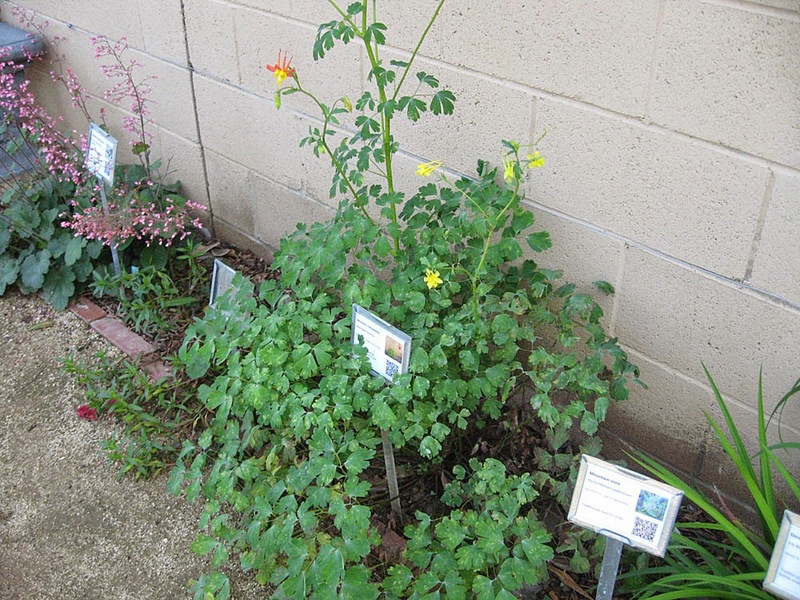 Some Ranunculaceae produce chemicals that are toxic to humans and animals, so it’s best to learn their properties before including them in your garden. 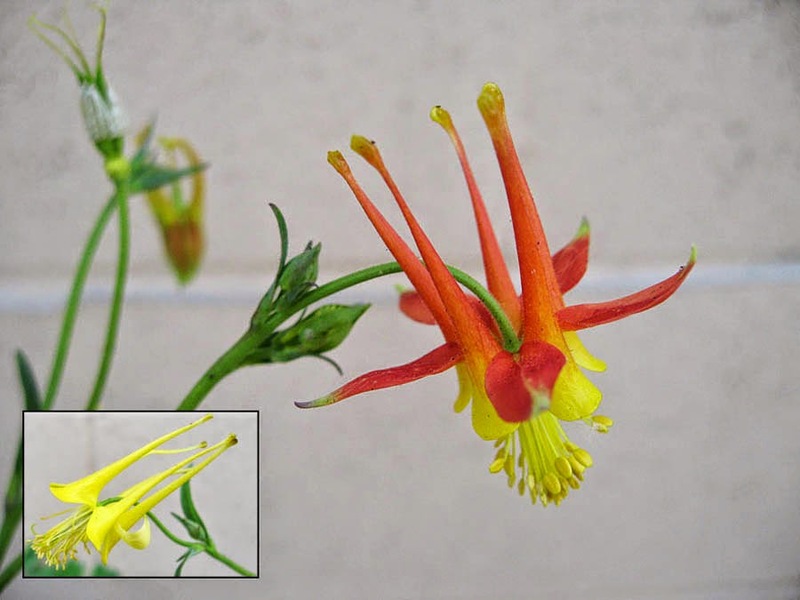 Western columbine can be found from Alaska and Montana to Baja California, Mexico. It grows throughout much of the California Floristic Province (west of the Sierra Nevada Range), with the exception of the Great Central Valley, South Coast, and Channel Islands. It inhabits moist places in many plant communities including stream banks, seeps, chaparral, oak woodland, mixed evergreen forest and coniferous forest to 8000 foot elevation. In Southern California, it can be found in the San Gabriel and Liebre Mountains. 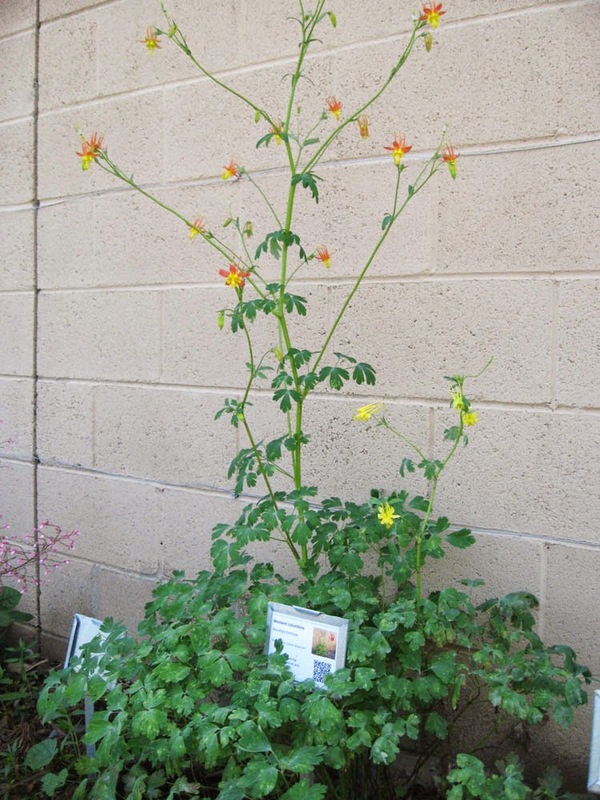 An herbaceous perennial, Aquilegia formosa is 2-3 feet tall and about as wide. Drought deciduous, it normally dies back in summer; given water, it can remain green until fall. The foliage is pale blue-green, becoming red-tinged if dry. 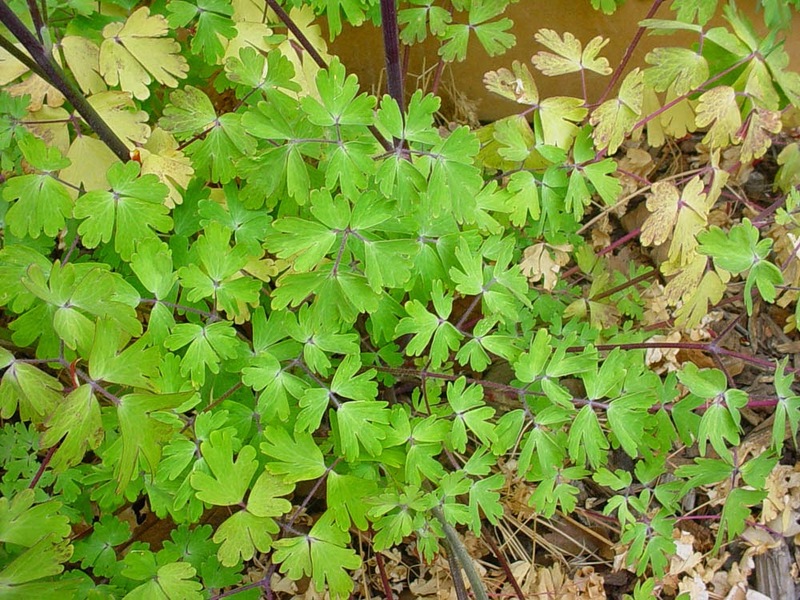 The leaves look somewhat like an over-sized Maidenhair fern, with deeply lobed leaflets in groups of three (see below). The foliage grows mostly as a mound of green at the base. The plant is similar in appearance to the related Fendler’s meadow rue (Thalictrum fendleri), also growing in our Garden of Health. 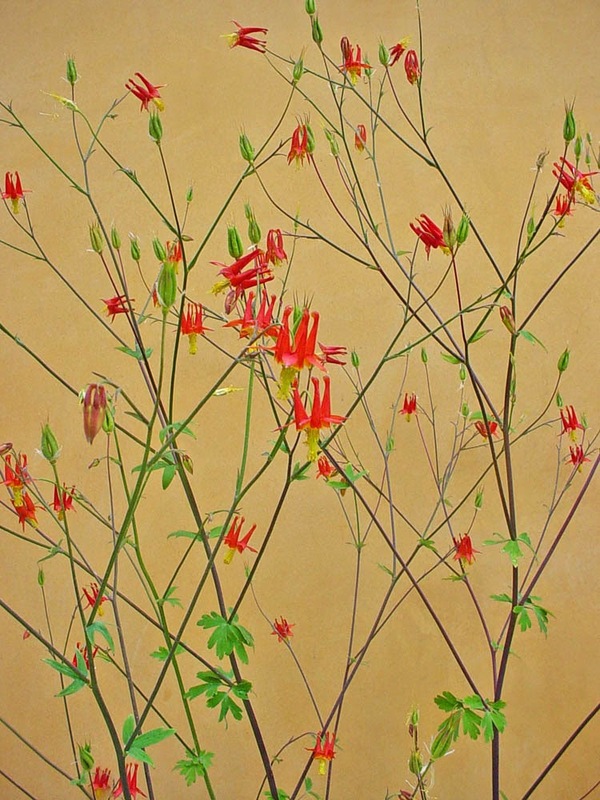 Despite the delicate appearance, Aquilegia formosa is a fairly hardy plant. Western columbine flowers in late spring or summer. In local lowland gardens, it may bloom as early as April; in areas with cool spring weather, it can flower as late as August. As seen above, the flowers grow at the ends of erect, many-branched flowering stalks; the overall appearance being open and lacy. Blooming plants are so unique that they attract rapt attention, at least in our garden. Columbine flowers seem destined to be admired and photographed! The flowers of Aquilegia formosa, while smaller than those of Columbine cultivars, possess all the charm of their larger brethren. The flowers are described as ‘nodding’; they droop and sway on their branches, unlike the more stiffly erect flowers of other species. Our plant in the Garden of Health has flowers somewhat in-between (see below). The surprise appearance of an erect, yellow-flowered plant this year (inset, below) strengthens our suspicion that our plant may be a hybrid, rather than the straight species. Western columbine is known for its brilliantly colored flowers. If you like red and yellow, this is surely a plant you’ll like! 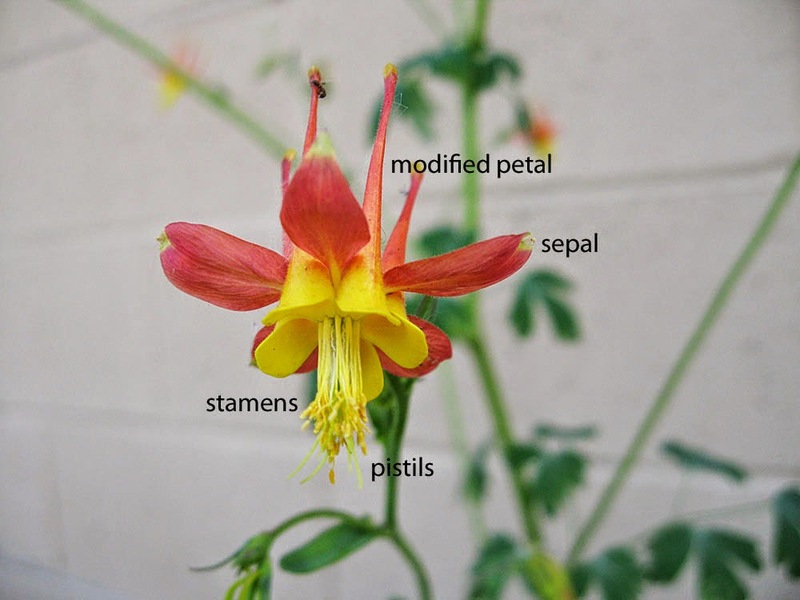 Columbines have a highly modified floral structure designed to attract specific pollinators. The five red, petal-like structures are actually sepals (structures that are often green and inconspicuous in other flowers). 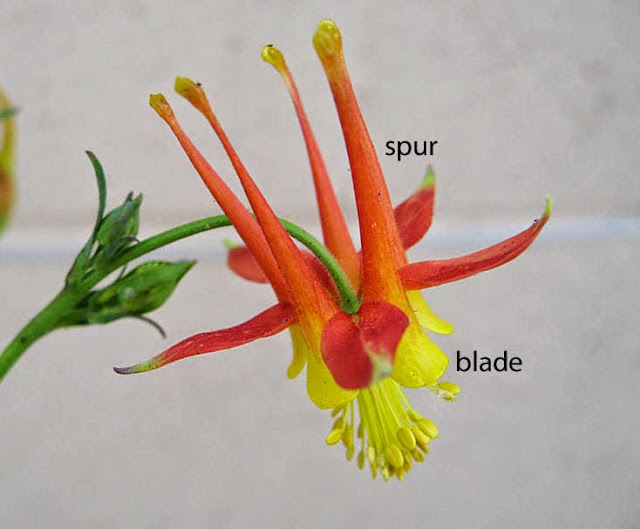 The yellow and red petals form tube-like structures with a broad, yellow opening (the ‘blade’) and a narrow red-orange tube (the ‘spur’). The spurs in Aquilegia formosa are relatively short and straight compared to other Columbines. Its flowers are pollinated by long-tongued pollinators, primarily hummingbirds (and occasionally large butterflies). The nectar is stored in the tips of the spurs, where only a long-tongued pollinator can reach it; and the pendant flowers are easiest for hummingbirds to access. The nectar is extra sweet – another hummingbird adaptation found in this species. Western columbine does best with some shade. In local gardens, we recommend planting it under trees (dappled shade) or in bright shade on the north side of buildings or walls. While preferring a well-drained soil, it does fine in clay-loams and tolerates a wide pH range (4.0-8.0). Plants do need moist soils, at least until flowering ceases; they can even tolerate winter flooding. 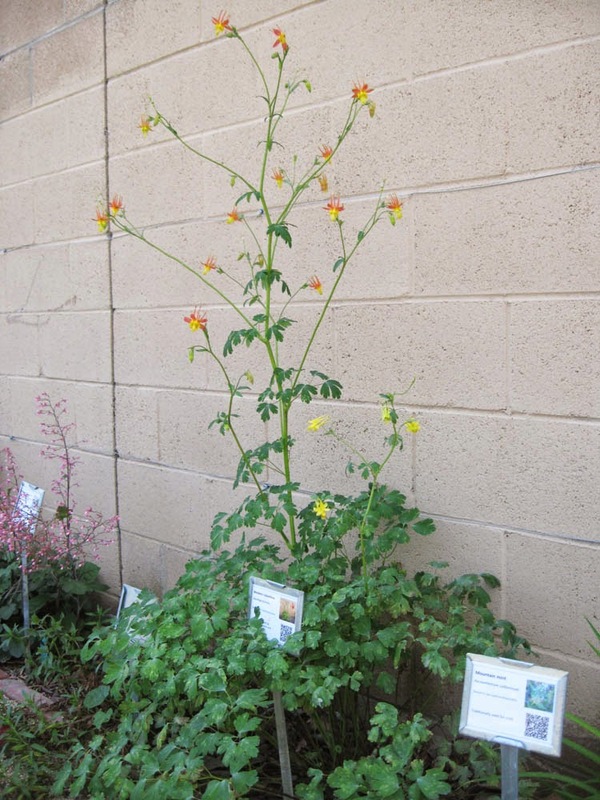 Consider planting Columbines with other water-loving plants so they receive the moisture they need. 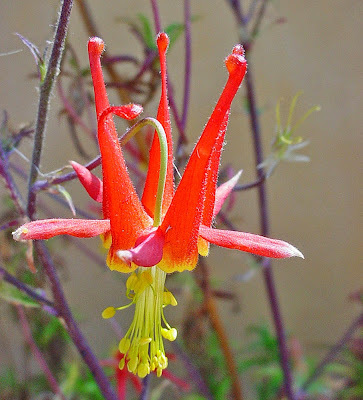 While short-lived (3-4 years), Western columbine reseeds well in many gardens. Each flower can produce many small, dark seeds. 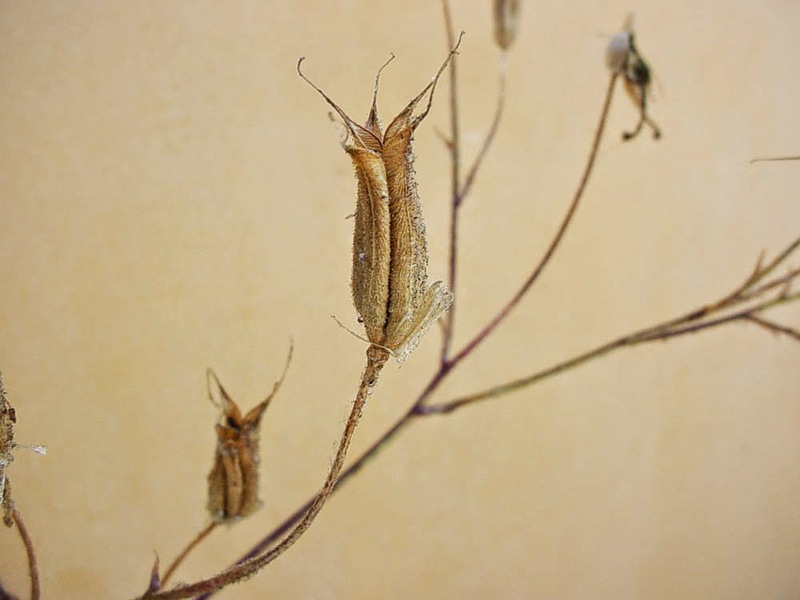 As seen in the photo above, the dry seed capsules open from the top and wind plays a role in distributing seeds. To prevent re-seeding (and prolong flowering) deadhead flowers regularly. Watch seed capsules closely if you wish to collect the seed; seeds can ripen quickly in warm weather. Some gardeners cut off the semi-dry fruiting stalks and place them upside down in a paper bag, allowing the seeds to harvest themselves. If starting plants from fresh seed, simply scatter seeds in the garden or start them, barely covered, in pots in spring or fall. Older seeds – or those from colder climates – may germinate better with a short cold-moist pretreatment. Soak seeds overnight, then place in a damp coffee filter (folded to contain the seeds) and store in an open plastic bag in the refrigerator for 3-5 days before planting. Seeds will take 3-4 weeks to germinate. Columbines make a lovely addition to shady areas of the garden. They add woodland charm to shady places under trees and do well with our moisture-requiring native ferns. Place them where you can enjoy visits from the local hummingbirds – near a bench or porch. In nature, Western columbine sometimes forms large colonies in open areas. Mass plantings in the garden can be equally spectacular! Columbines can even be grown in large containers. And the flowers make a spectacular addition to floral arrangements. Native peoples use Aquilegia formosa where ever it grows. All part of the plant (with the possible exception of the flowers) are at least mildly toxic. So we don’t recommend eating it, though some native peoples did so in the past. But the medicinal uses of this plant are legion. That’s why we grow it in Mother Nature’s Garden of Health. Mashed fresh roots are traditionally rubbed on aching, arthritic joints and applied to bee stings and skin sores to relieve pain; a poultice of fresh leaves is used similarly. Several tribes report using a mild decoction of the leaves for sore throats, colds and coughs. A decoction of roots and leaves was taken for dizziness and stomach upset; and a decoction of roots is a traditional Shoshoni medicine for stomachaches, diarrhea and to induce vomiting. As with all medicines – particularly those taken internally – caution is advised. There is often a thin margin of error with medicines: the right dose can heal, but the wrong dose can kill (or make you very sick). The seeds of Aquilegia formosa are very fragrant. They were traditionally ground or chewed to release the scent, then used as a perfume (or to cure head lice!). You can grind the seeds and include them in potpourri or use sachets of ground seeds perfume clothing. The flowers are said to be good luck charms in some Native American cultures. We can’t vouch for their efficacy as charms – but they certainly are special flowers!